A New Vision for Scottish Agriculture? 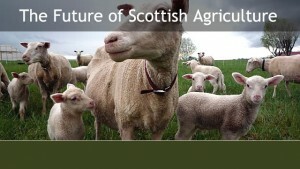 In June 2015 the Scottish Government released a discussion document, The Future of Scottish Agriculture, setting out a vision and strategy for farming in Scotland in the next decades. It was an open consultation, with the Government keen to spread the debate beyond the usual suspects and accepting responses until Spring 2016. What is farming for? And where should farming be going? To feed us well? To sustain rural communities and livelihoods? To generate profits and boost our exports? To look after our land and to protect and enhance our environment? We can’t envision the future of farming in Scotland without reflecting on what farming is for in the first place. And it’s important to ask this question now. Our farmers are facing tough times economically. At the same time we are also facing environmental challenges. Meeting these challenges may mean changes to how we farm today – and will influence what will be on our plates tomorrow. It’s time to take a step back, and to consider the relationship between farmers, society and the land. Nourish Scotland supported this consultation by organising a series of 8 events across Scotland in November and December 2015, to allow as wide a range of people as possible to participate and share their views on the role and future of farming. To support these events, we also produced a briefing paper outlining the scale of farming in Scotland, discussing some of the challenges faced by the sector and summarising the Scottish Government’s document. The events were attended by more than 170 people and a wealth of ideas was shared and generated on the direction of travel for food and farming in Scotland. Diversity, connection and responsiveness were among the key themes emerging. You can also read a blog post by Sarah Beattie Smith on the Dumfries event here. In early 2016 we also published our Response to the Scottish Government’s Future of Scottish Agriculture consultation. The Scottish Government published its consultation summary at the Royal Highland Show in June 2016. The Brexit vote on 23rd June overshadowed this publication, but it also gave the questions about the future of Scottish agriculture a whole new dimension and importance. Nourish’s views on Brexit are explained here.